The best hits from ELO, the rock orchestra hit machine. 6 – Evil Woman (1975) from the LP Face the Music, this was their first big hit in the US. 7 – Turn to Stone (1977) from the unprecedented 2-LP “Out of the Blue” featuring that cool spaceship cover. 8 – Livin' Thing (1976) their fist song performed on The Midnight Special with Wolfman Jack. 9 – Calling America (1986) from Balance of Power. This was their final hit in the US. 14 – Xanadu (1980) featuring Olivia Newton-John. Good song, weird movie. 19 – Wild West Hero (1977) another sweet melody from the double set Out of the Blue. Also a big fan of “Mission (A World Record),” a poignant sci-fi tune from ELO's big sixth LP. Those are the best tunes from the the stringed rockers, ELO's top songs. The band holds the record for having the most top 40 pop songs, without any of them reaching #1. Their pop and rock influence is still felt today. 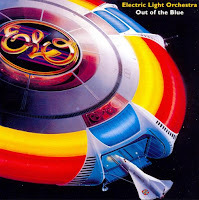 The Electric Light Orchestra started a trend with strings in rock music that is taken for granted in new rock.